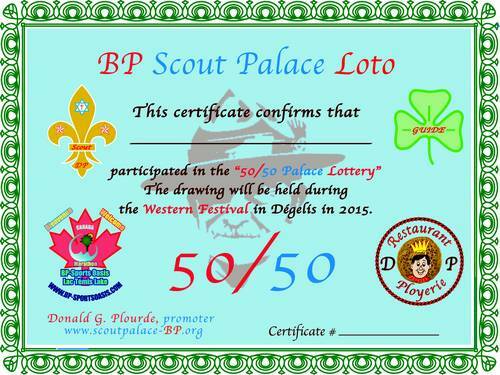 The BP 50/50 Scout Palace Lotto certificate costs $25 and is shared as follow: 50% to the winner of the BP 50/50 Lotto, 20% to Scout Palace Inc., a non-profit organization. The remaining 30% will be shared among some French-speaking and English-speaking scout sectors in Canada. The first draw of the Lotto 50/50 BP will take place at the Dégelis Western Festival in 2015. Subsequently, it will be done annually during a festival around the beautiful Témiscouata Lake.